The 2018 winter Olympics are set to kick off in Pyeongchang this week, with the first competitions beginning on Wednesday night, just before the Opening Ceremony on Friday. There will be six new events this year — snowboard big air (men’s and women’s), speed skating mass start (men’s and women’s), curling mixed doubles, and the Alpine team event — bringing the total number of gold medal events up to 102, which is the highest number to date at a Winter Olympic Games. Team USA is also breaking records this year, bringing 242 athletes over to compete — the largest delegation of any nation in the history of the Winter Olympics. With a full 19 days of competition, there’s a lot of cold-weather sports to keep up with, so to make things more manageable, Vulture has compiled a day-by-day guide to the Games’ major events. In the U.S., the 2018 Winter Olympics will be broadcast on NBC and NBC sports, and will be streaming live on NBCOlympics.com. Note: All times are in Eastern Standard. The round-robin stage for mixed doubles curling begins on the 7th (the 8th in local time), before the opening ceremony. Hopefully it will showcase the Norwegian team’s bold sartorial choices. Mixed doubles curling begins at 7:05 p.m. The round-robin stage for mixed doubles curling continues. The first qualifying rounds for ski-jumping and freestyle skiing, as well as figure skating take place. Men’s Ski Jumping, qualifying rounds: 7:30–9:40 a.m.
Men’s and Pairs Figure Skating: 8–11:30 p.m.
Women’s Freestyle Skiing: 8–8:45 p.m.
Men’s Freestyle Skiing: 9:45–10:30 p.m. If you can summon the courage to emerge from under the covers at 6 a.m. EST, you can catch the fanfare of the opening ceremony in the new Pyeongchang Olympic Stadium live. If not — NBC’s Katie Couric and Mike Tirico will host a rebroadcast of the event, featuring interviews and commentary, at 8 p.m. — a much more agreeable hour. As per usual, every country will march under their own flag during the Parade of Nations — except for athletes from North and South Korea, who will march under one flag and compete as a single team. Opening Ceremony: 6–8 a.m. (rebroadcast at 8 p.m. on NBC). Men’s snowboarding qualifying rounds: 8–11:47 p.m. Curling round-robin stages continue, while preliminary rounds for ice-hockey and luge begin. Biathlon, cross-country skiing, ski jumping, and speed skating medal events start in the wee hours of Saturday morning. In the evening, the finals for men’s slopestyle snowboarding take place. Women’s Cross-Country Skiing, 7.5km & 7.5km Skiathlon: 2:15–3:20 a.m.
Biathlon, Women’s 7.5km Sprint: 6:15–7:45 a.m.
Women’s Speed Skating 3000m: 6–7:45 a.m. Ski Jumping, Men’s Normal Hill Individual Final: 8:35–9:20 a.m.
Snowboard, Men’s Slopestyle Finals: 8–9:45 p.m.
Alpine Skiing, Men’s Downhill: 9–11:05 p.m.
Medal events on Sunday include the 15km race for men’s cross-country skiing and the men’s 500m speed skating race, which begin in the very early hours of the morning. In the evening, the women’s slopestyle snowboarding finals and the Ice Dance Figure Skating Competition take place. At Sochi, the U.S. took home the gold for the first ever women’s slopestyle event when snowboarder Jamie Anderson made Olympic history. Men’s Cross-Country Skiing, 15km & 15km Skiathlon: 1:15–3:10 a.m. Speed Skating, Men’s 5000m: 2–4:15 a.m.
Freestyle Skiing, Women’s Moguls Final: 5:30–6 a.m.; 7–8:40 a.m.
Biathlon, Men’s 10km Sprint: 6:15–7:15 a.m. Figure Skating, Men’s & Women’s Single Free Skating: 8–11:25 p.m.
Snowboard, Women’s Slopestyle Finals: 8–9:45 p.m.
Alpine Skiing, Women’s Giant Slalom: 8:15–9:55 p.m.; 11:45 p.m.–1:35 a.m. Although snowboarder Chloe Kim qualified for the Winter Olympics in Sochi, the then 13-year-old was too young to go. At 17 she is a favorite to win the women’s snowboard halfpipe contest and beat her hero, Kelly Clark, who is competing in her fifth Winter Olympics. Medal events for the men’s and women’s biathlon pursuit races also take place, along with the men’s freestyle skiing finals and the women’s normal hill ski jumping finals. Biathlon, Women’s 10km Pursuit: 5:10–6 a.m.
Freestyle Skiing, Men’s Moguls Final: 5:30–6 a.m.; 7–8:40 a.m.
Biathlon, Men’s 12.5km Pursuit: 7–7:55 a.m. Ski Jumping, Women’s Normal Hill Individual Final: 7:50–9:20 a.m. Speed Skating, Women’s 1500m: 7:30–9:10 a.m. Curling, Mixed Doubles Bronze Medal: 7:05–9 p.m.
Snowboard, Women’s Halfpipe Finals: 8–9:40 p.m.
Alpine Skiing, Men’s Alpine Combined: 9:30–11:10 p.m.
Mikaela Shiffrin is back to defend her gold in the women’s slalom. The 22-year-old won back in 2014 and has since moved up to the second spot on Team USA’s list of most world cup wins. Veteran halfpipe snowboarder Shaun White is also vying to make it to today’s finals. But the real must-watch event of the day is the women’s short track speed skating 500m final. At the age of 17, Maame Biney is the first black woman to compete as part of the U.S. Olympic team in this category. Alpine Skiing, Men’s Alpine Combined: 1–2:25 a.m.
Cross-Country Skiing, Men’s & Women’s Individual Sprint Classic: 3:30–4:45 a.m.; 6–8 a.m.
Short Track Speed Skating, Women’s 500m Final: 5–7:30 a.m. Speed Skating, Men’s 1500m: 6–7:45 a.m. Curling, Mixed Doubles Gold Medal: 6:05–8:20 a.m.
Alpine Skiing, Women’s Slalom: 8:15–9:50 p.m.; 11:45 p.m.–1:25 a.m.
Snowboard, Men’s Halfpipe Finals: 8:30–10:10 p.m.
She holds the world record for the women’s 1000m speed skating, and after a disappointing turn of events at Sochi, Brittany Bowe seems poised for an Olympic comeback. Keep an eye out for Team USA’s underdogs during today’s men’s cross snowboarding finals. Nordic Combined, Men’s Individual Normal Hill: 1–1:55 a.m.
Biathlon, Women’s 15km Individual: 6:05–8 a.m.
Nordic Combined, Men’s Individual 10km: 3:45–4:45 a.m. Speed Skating, Women’s 1000m: 5–6:30 a.m. Figure Skating, Pairs Free Skating: 8:30–11:55 p.m.
Alpine Skiing, Men’s Super-G: 9–11:10 p.m.
Snowboard, Men’s Cross Finals: 11:30 p.m.–1 a.m. This is U.S. competitor Lowell Bailey’s fourth foray into the Winter Olympics biathlon, and he has yet to medal. In fact, Team USA has never medaled in the biathlon at any Winter Olympics. That could change in today’s men’s individual 20km event, but France’s Martin Fourcade is still a favorite for gold. Other events today include the women’s snowboard cross finals and the luge team relay event. Cross-Country Skiing, Women’s 10km Free: 1:30–3:30 a.m.
Biathlon, Men’s 20km Individual: 6–8 a.m. Speed Skating, Men’s 10,000m: 6–8:10 a.m.
Luge, Team Relay: 7:30–8:45 a.m.
Snowboard, Women’s Cross Finals: 10:15–11:15 p.m. Team USA frequently excels in freestyle-skiing events, and today’s women’s aerial and slopestyle finals could be a scoop for the team. The men’s single free skating will feature Nathan Chen, the star of the U.S. Olympic team and a clear favorite to win gold. The man who has been called a god has quite the trump card: Five quadruple jumps in a single performance. Cross-Country Skiing, Men’s 15km Free: 1–2:50 a.m.
Freestyle Skiing, Women’s Aerial Finals: 6–7:20 a.m. Speed Skating, Women’s 5000m: 6–7:30 a.m. Figure Skating, Men’s Single Free Skating: 8 p.m.–12:25 am. Alpine Skiing, Women’s Super-G: 9–10:55 p.m.
Freestyle skier Gus Kenworthy took a hit during the qualifiers for the halfpipe skiing, but could medal in the slopestyle. But all is not lost if he doesn’t get a spot on the podium — Kenworthy, who came out as gay in 2015, tweeted that he is really excited to meet the other athletes. Biathlon, Women’s 12.5km Mass Start: 6:15–7:10 a.m.
Cross-Country Skiing, Women’s 4x5km Relay: 4:30–5:45 a.m.
Short Track Speed Skating, Women’s 1500m Final, Men’s 1000m Final: 5–7:55 a.m. Ski Jumping, Men’s Large Hill Individual Final: 7:30–9:15 a.m.
Alpine Skiing, Men’s Giant Slalom: 8:15–10:10 p.m.; 11:45 p.m.–1:45 a.m.
Freestyle Skiing, Men’s Slopestyle Finals: 11:15 p.m.–12:50 a.m. The day starts with some cross-country and freestyle skiing before Erin Jackson puts on her speed skates. She qualified for the women’s 500m and made history as the first African-American to qualify for the U.S. Olympic long track speed skating team. Cross-Country Skiing, Men’s 4x10km Relay: 1:15–3:10 a.m.
Freestyle Skiing, Men’s Aerial Finals: 6 a.m.–7:20 a.m. Speed Skating, Women’s 500m: 6–7:55 a.m.
Biathlon, Men’s 15km Mass Start: 6:15–7:15 a.m.
Maddie Bowman won gold in the women’s ski halfpipe finals in Sochi, and bets are on that she’ll do it again. Other events today include free dance figure skating and men’s ski jumping. 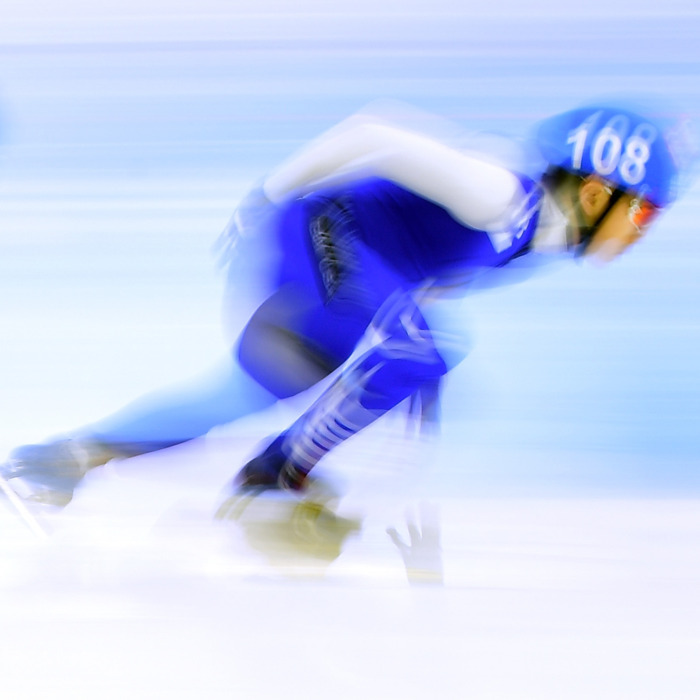 Speed Skating, Men’s 500m: 6–8 a.m. Ski Jumping, Men’s Team: 7:30–9:30 a.m. Figure Skating, Ice Dance Free Dance: 8–11:45 p.m.
Freestyle Skiing, Women’s Ski Halfpipe Finals: 8:30–9:55 a.m. If Lindsey Vonn’s recent winning streak is anything to go by, the three-time Olympian is ready and able to scoop up an armful of medals in Pyeongchang. She takes on her challengers today in the women’s downhill alpine skiing. Finals in short track speed skating and men’s ski cross also take place. Short Track Speed Skating, Women’s 3000m Relay Final: 5–7 a.m.
Nordic Combined, Men’s Individual Large Hill: 5–5:55 a.m.
Nordic Combined, Men’s Individual 10km: 5:45–6:45 a.m.
Biathlon, 2x6km Women’s & 2x7.5km Men’s Mixed Relay: 6:15–7:45 a.m.
Freestyle Skiing, Men’s Ski Cross Finals: 11:15 p.m.–12:55 a.m.
Wake up for one of the most historic moments of this year’s games: Team Nigeria is the first African bobsled team to compete in the Olympics and Seun Adigun, Akuoma Omeoga and Ngozi Onwumere are bringing it. With Serena Williams cheering them on of course. Cross-Country Skiing, Women’s and Men’s Team Sprint Free: 3–4:30 a.m.; 5–6:20 a.m.
Ice Hockey, Women’s Bronze Medal: 2:40–5 a.m. Speed Skating, Women’s and Men’s Team Pursuit Finals: 6–8:50 a.m.
Alpine Skiing, Men’s Slalom: 8:15–10:10 p.m.; 11:45 p.m.–1:40 a.m.
Freestyle Skiing, Men’s Ski Halfpipe Finals: 9:30–11:00 p.m.
Ice Hockey, Women’s Gold Medal: 11:10 p.m.–2 a.m. This is 18-year-old figure skater Karen Chen’s first Olympics, just like her male counterpart Nathan Chen, as part of the American team. Nope, they’re not related. The 2017 U.S. Champion is a hopeful for the women’s free single skating finals. The women’s snowboard big air finals, as well as a few short track speed skating finals, are among the other events lined up for today. Biathlon, Women’s 4 x 6km Relay: 6:15–7:45 a.m.
Nordic Combined, Men’s Team Large Hill: 2:30-3:10 a.m.
Nordic Combined, Men’s Team 4 x 5km: 5:20–6:20 a.m.
Short Track Speed Skating, Men’s 500m Final, Women’s 1000m Final, Men’s 5000m Relay Final: 5–7:45 a.m. Figure Skating, Women’s Free Single Skating: 8 p.m.–12:45 a.m.
Alpine Skiing, Women’s Alpine Combined: 9–10:25 p.m.
Freestyle Skiing, Women’s Ski Cross Finals: 11:15 p.m.–12:55 a.m.
Snowboard, Women’s Big Air Finals: 7:30–9:15 p.m.
All eyes will be on 17-year-old Red Gerard, who could become the youngest U.S. snowboard competitor to medal in the men’s big air event at the Games. The women’s and men’s parallel giant slalom finals, as well as the men’s 1000m speed skating also take place. Alpine Skiing, Women’s Alpine Combined: 12:30–1:45 a.m.
Biathlon, Men’s 4 x 7.5km Relay: 6:15–7:45 a.m. Curling, Men’s Bronze Medal: 1:45-4:30 a.m. Speed Skating, Men’s 1000m: 5-6:35 a.m.
Snowboard, Men’s Big Air Finals: 8–9:45 p.m.
Alpine Skiing, Alpine Team Event: 9–10:55 p.m.
Snowboard, Women’s/Men’s Parallel Giant Slalom Finals: 10–11:30 p.m.
It’s a big day for medals — the ice hockey men’s final, the 4-man bobsleigh, and the men’s and women’s curling gold medals events take place today. Later, it’s all about the figure skaters letting their hair down in the gala exhibition. The non-competitive event showcases the medal-winners of the competition and there are no restrictions as to what they can show. Maybe someone will have a bit of fun on the ice with “Turn down for what?” in there à la skater Jimmy Ma. Cross-Country Skiing, Men’s 50km Mass Start Classic: 12–3:05 a.m. Curling, Men’s Gold Medal: 1:35–4:55 a.m. Curling, Women’s Bronze Medal: 6:05–9 a.m. Speed Skating: Women’s/Men’s Mass Start: 6–8:40 a.m.
Ice Hockey, Men’s Bronze Medal: 7–10 a.m. Curling, Women’s Gold Medal: 7:05–10:25 p.m. Figure Skating, Gala Exhibition: 7:30–10 p.m.
Ice Hockey, Men’s Gold Medal: 11:10 p.m.–2 a.m.
By day’s end a record number of 102 medals will have been awarded and thousands of people will gather one more time at the Pyeongchang Olympic Stadium for the closing ceremony. We’re all hoping for a good dose of K-pop before the Olympic flag is passed to officials from Beijing where the next winter games will take place in 2022. Cross-Country Skiing, Women’s 30km Mass Start Classic: 1:15–3:20 a.m.
A complete schedule of the Pyeongchang 2018 Winter Olympic Games is available at NBCOlympics.com.